We educate about Savannah Cats. So families get healthy kittens. The Savannah Cat Association began to raise the standard of breeders around the world. Our first thought was, “how do we do this?” We believe the answer is to educate. The more breeders know and understand, allows them to raise their standards of health, care and socialization. • For instance, perhaps a breeder used bleach or Lysol to clean the floors in the nursery where there was a pregnant queen. The article on cleaners would have explained why not to use and what is a great substitute. Therefore, protecting the expectant queen and her kittens from trauma. • Another item that breeders might need to know is what exact Vaccines for Savannah Cats immunizations to give kittens and adults. There are many websites with conflicting ideas, beliefs and old wives’ tales. Our site gives the true and up to date research that is also consistently used by our responsible member breeders. • The Savannah Standard is another area. To educate here is important. Breeders should use only the accepted colors. Accept no malformations such as overbite, underbite and extra toes (polydactyl deformities). Finally, we use education as a way for breeders to actually breed for what makes our breed so exotic looking. Things like tall-wide ears placed close together, flat eyes, wide nose, clear, black-spotting, long-body, short, thick-tail and long elegant legs, like the cats pictured on this site. Accepted colors, Brown spotted, silver spotted and black and black smoke. The more potential owners know about what to expect, allows them to find breeders who have the absolute friendliest, well-socialized and healthiest cats. • It’s all about trust. Here the breeders can show you in our Member Chart all the steps they may take to get you the best cat possible. 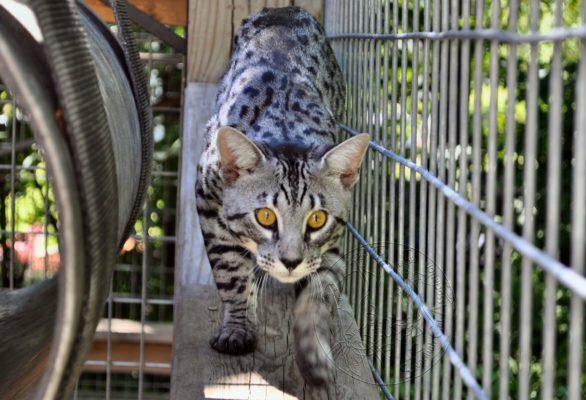 • We provide potential pet buyers and potential future breeders with everything needed to prepare to find the best fit for their first Savannah cat or Savannah Kitten and future searches to own another because they just can’t own one. • There are questions to ask any potential breeder that you may not have thought to ask. Now it’s simple to cover all the bases with our FAQs as well. • We are a team. If you have difficulties our breeders have agreed to mediation to find help or solutions if needed. We, the breeders of Savannah Cat Association, sincerely hope you will find our site helpful and enlightening.